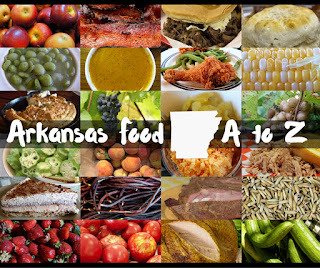 Arkansas has its share of chain restaurants where one can go to get a burger, fries or a shake. But there’s a homegrown chain that took off here from 1948 that still holds a dear place in the taste memories of thousands of Arkansawyers. Kat Robinson shares why it’s time to bring back the Minute Man. What would Wendy’s be like without the slogan “Old-Fashioned Hamburgers?” Would fast food restaurants be the same without product giveaways? And would those chains be so popular without special meals for kids? 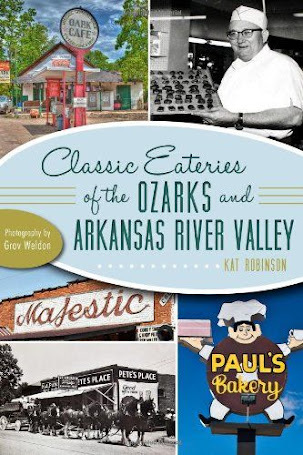 These sort of developments were part of the marketing genius of an Arkansas-based hamburger chain that’s almost faded from history. Almost. Of course, with a little luck and a lot of participation, it could come back. Of course, I am talking about the Minute Man. 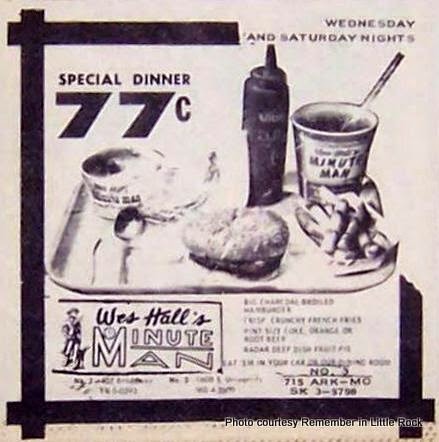 Wes Hall’s original concept restaurant came out of a 24 hour coffee shop he owned with two other partners at 407 Broadway in Little Rock, way back in 1948. 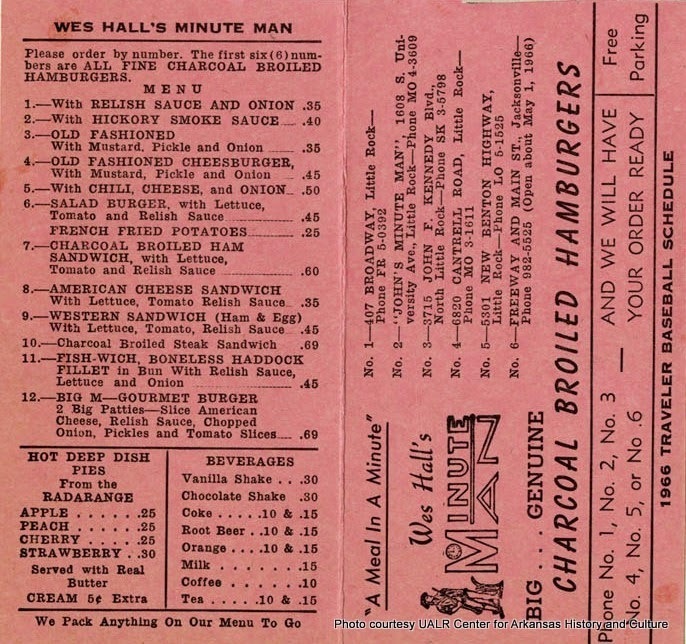 Eight years into the operation, he bought out his partners and converted the place into a hamburger joint. Soon, he had franchised out the Minute Man name and product across the state and even further – to seven states and 57 locations. 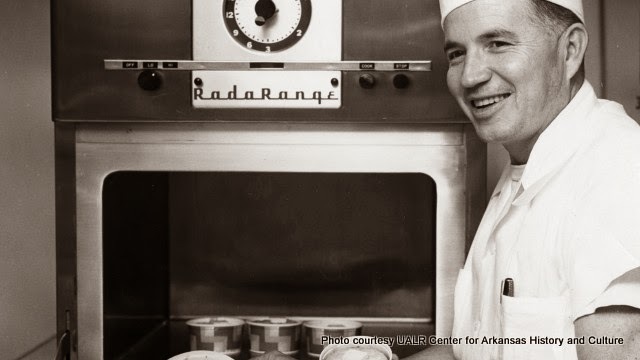 Hall’s first restaurant was one of three in the nation to receive brand new microwave “Radar Ranges” from Raytheon to try out – and Minute Man pioneered microwave usage in fast food. 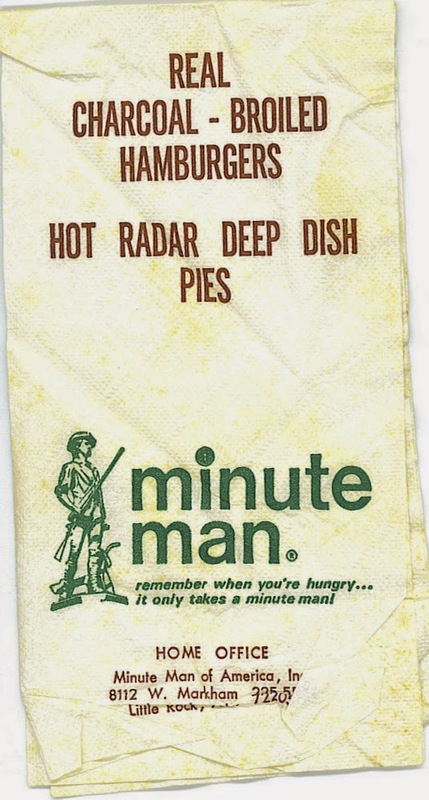 If you ever had the chance to savor a Radar Deep Dish Pie (if you were smart enough to let it cool, of course, and didn't singe off your taste buds), you had a microwaved food item – a disc of doughy crust atop the bubbling magma of the filling – in cherry, peach, apple or strawberry. He understood marketing before marketing was a big buzz word in Arkansas. He figured out what people wanted and got them to buy those things from his store. And he knew how to cross-promote. 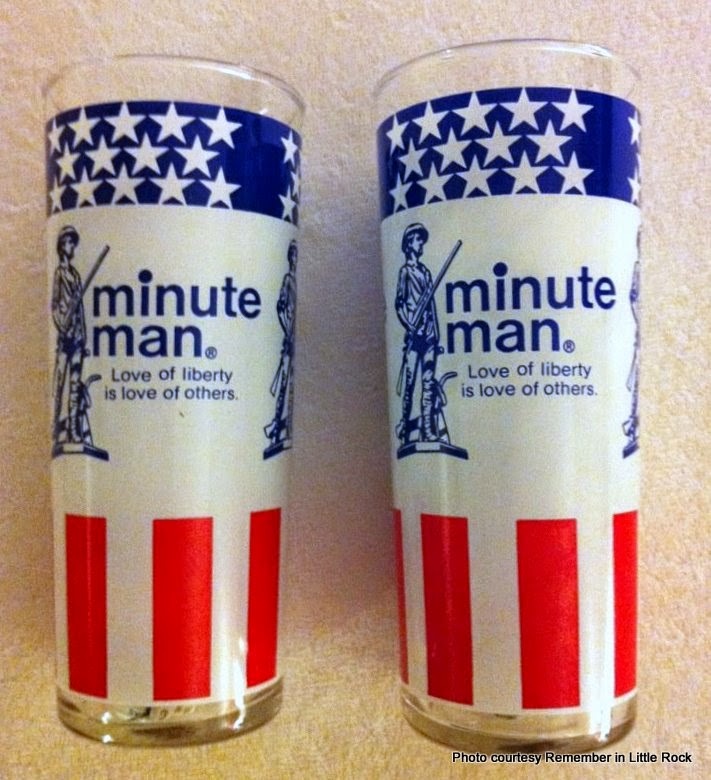 Back in 1975, he teamed up with the Coca-Cola company to do something revolutionary – offer a real glass with the Minute Man logo with a drink purchase. You’ll still see those bold red, white and blue bi-centennial glasses in homes and on the shelves of local flea markets. 1975 was also the year the Magic Meal was patented. 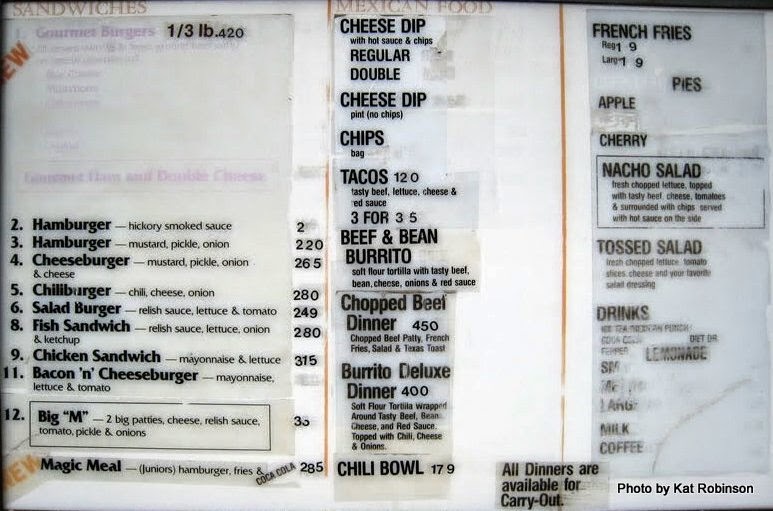 It may be hard for some of you younger folks to believe, but used to be if you wanted to order something for your kid, it came off the same menu as the adults used. Here’s a link to the patent – which includes the idea of “PREPARING A HAMBURGER SANDWICH WITH FRENCH FRIED POTATOES SOLD IN A SPECIAL CONTAINER WHICH CONTAINS A MAGIC TRICK, SOLD AS PART OF A RESTAURANT OPERATION.” Minute Man sold Magic Meals two years before McDonald’s recognizes the birth of the Happy Meal. Eventually Minute Man sold the rights to sell Magic Meals (including the name) to Burger King – which did so in 1982 and 1983. Minute Man also beat McDonald’s to the punch on a signature sandwich. 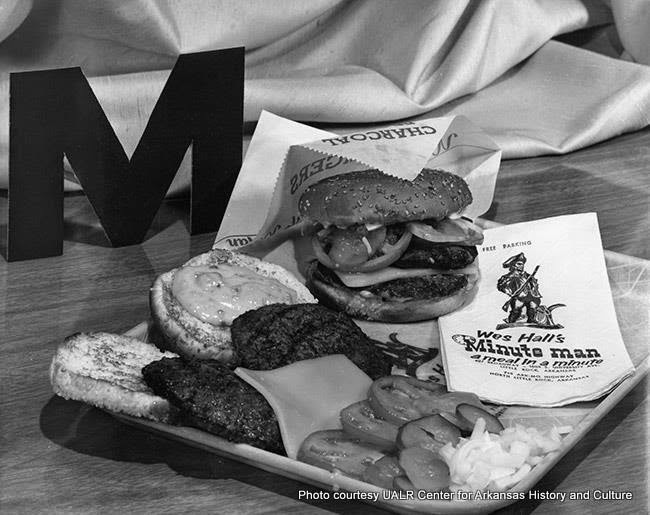 The “Big M” was a double full-sized patty burger that came with cheese, chopped onion, lettuce, tomato and a relish sauce which debuted in 1966. The Big Mac, McDonald’s signature burger, debuted in 1967 at a single location in Pennsylvania. 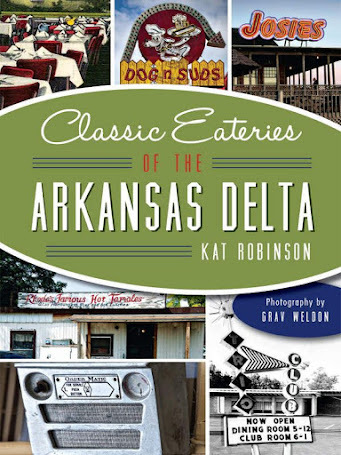 Wes Hall was an innovator, for sure – and Minute Man became part of the fabric of Arkansas food culture. 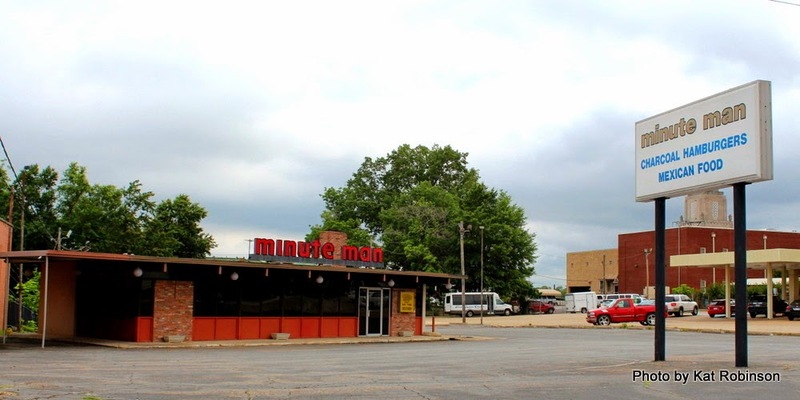 If you were to ask someone from around here which restaurant would survive to today, Minute Man or McDonald’s, back in 1977 – chances are they’d guess Minute Man. Of course, in 1977, they’d also have likely guessed that Breaker Drive-Ins would be around, rather than Sonic – but that’s a story for a different time. When I wrote this blog back in March of 2013, I had no idea how many people were about to come out of the woodwork to reminisce with me. 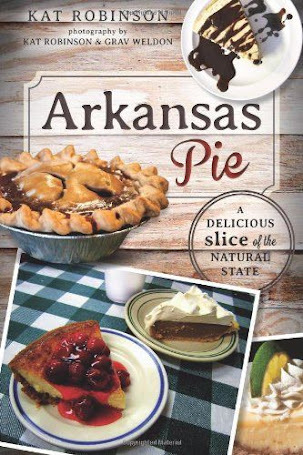 THV 11 did a piece in the time I was doing my research… and Monica Madey Mylonas followed in May with a feature in the third edition of Arkansauce. The UALR Center for Arkansas History and Culture debuted a new Character Collection piece on Wes Hall and Minute Man. And talk got around. Someone even gave me a copy of the old relish sauce recipe from the Minute Man… but I’m not quite ready to share it. I’m still looking to make sure I’m not stepping on any toes! But there seems to be a real desire to revisit those flavors. As I've mentioned in some of my recent talks here and there, some of our restaurant flavors can easily be saved and shared at other restaurants. In particular, what Local Lime in Little Rock is doing with its Taco Kid Tuesdays, offering dishes from the original Taco Kid the first Tuesday of each month, is a possibility. I’d love to see a restaurant offer up a Big M, a #2 (that’s the hickory burger with smoke sauce) or a Radar Deep Dish Pie as a call-back to a great era. 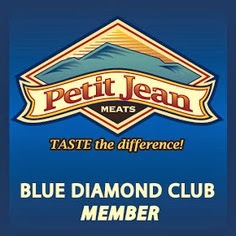 More than that, there have been rumors for years that the Minute Man chain could be franchised out. Wouldn’t that be neat? Here’s a great chance for a nostalgia trip. I could see one going up all decked out in 1960s-style décor – the hipsters would love it. But for those of us who have missed relish sauce and such, there is a single location of the Minute Man left. It’s in El Dorado on Main Street, a few blocks from the downtown square. 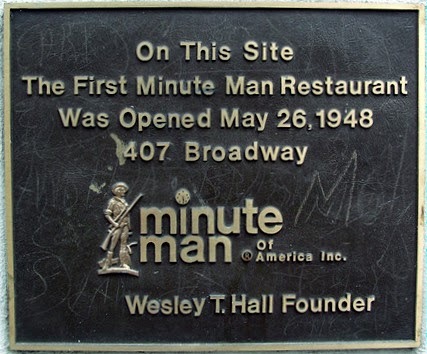 It’s a little odd – it serves Mexican food, too, or a facsimile thereof – but it does have that relish sauce and it is in one of the original Minute Man buildings. Patronize it if you are in the area, and think back to the days of Wes Hall and his innovative ideas. You’ll find the El Dorado Minute Man at 318 West Main Street – the phone number is (870) 862-7995. Wonder if "Crowd Funding" could get a few more of these restaurants opened? Here's a news report of a long gone restaurant from a chain that has reopened a store. Yes, it is and busy as ever!